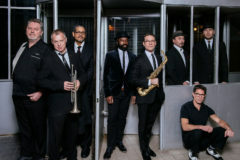 New Cool Collective – Official website » Recording new album & fall tour! Recording new album & fall tour! We are currently recording new songs for our twentieth (!) album. The album is scheduled for release this fall. Keep an eye on our social media and website, because we will drop a brand new track very soon! Along with the release of this new album, we will be touring the country. Pre-sale starts on Thursday, March 21st at 11 am.